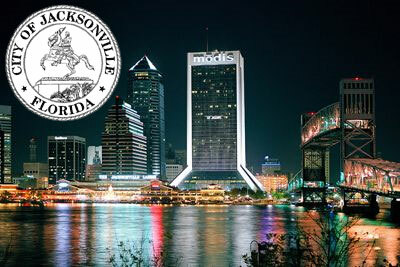 Jacksonville is Florida's largest city and is the county seat for Duval County. Jacksonville, Florida is larger then the cities of New York and Los Angeles put together! The city is located on Florida's "First Coast" region, located along the St. John's river. Jacksonville has a total population of almost 800,000 people. Although the city was founded in 1791 as "Cowford", Jacksonville was renamed in 1822 to honor Andrew Jackson, the would-be 7th President of the United States and then-military governor of Florida. Neighborhoods within today's Jacksonville include Bayard, Greater Arlington, La Villa, Mandarin, Northside, Springfield, Urban Core, and the Westside. Other cities in Duval County include Atlantic Beach, Baldwin, Jacksonville Beach, and Neptune Beach. Jacksonville locals moving to or from Florida, Moving On Up™ has got you covered. We are proud members of the American Moving and Storage Association (AMSA) and the Better Business Bureau. Our moving company performs same-day local moves for relocation anywhere within a 250 miles radius of Greater Jacksonville. Call us now at 1-800-945-9569 to speak to a moving consultant for more information. Plan your South Florida regional relocation by visiting our Local Moves and moving promotions pages. Moving On Up™ has plenty of resources available at your fingertips to assist you with your move to Jacksonville. Check out the Florida Times Union, the city's local newspaper for lifestyle information and current events, or visit Jacksonville and the Beaches' Convention and Visitor's Bureau for information on planning your visit to Jacksonville. Moving On Up™ is conveniently located in Orlando and able to help you with any moving needs. Give us a call at (954) 924-1522 to schedule an in-home estimate or book your move. Request a moving quote and get a FREE in-home visual estimate for an accurate, binding price. ©2008-2019 Moving On Up, Inc.™ All rights reserved. | Designed by E.Mau.